Alberti's Window: Similarities in Polynesia and Mesoamerica! Similarities in Polynesia and Mesoamerica! It just occurred to me that the Atlantean warrior figures from the Temple of the Morning Star (Tula, Mexico) and the figures from Easter Island (Ahu Nau Nau, Easter Island, Polynesia) were created roughly around the same time but on different sides of the world. Atlantean warrior figures, c. 900–1000 CE. Stone. Temple of the Morning Star (Tula, Mexico). Average height approx. 15' (4.5 m). You can get a sense of scale for the Toltec statues here. Image from Wikipedia via Luidger. Moai figures, Ahu Nau Nau, Easter Island, Polynesia, c. 1000–1500 CE. Volcanic stone. Average height approx 36' (11 m). 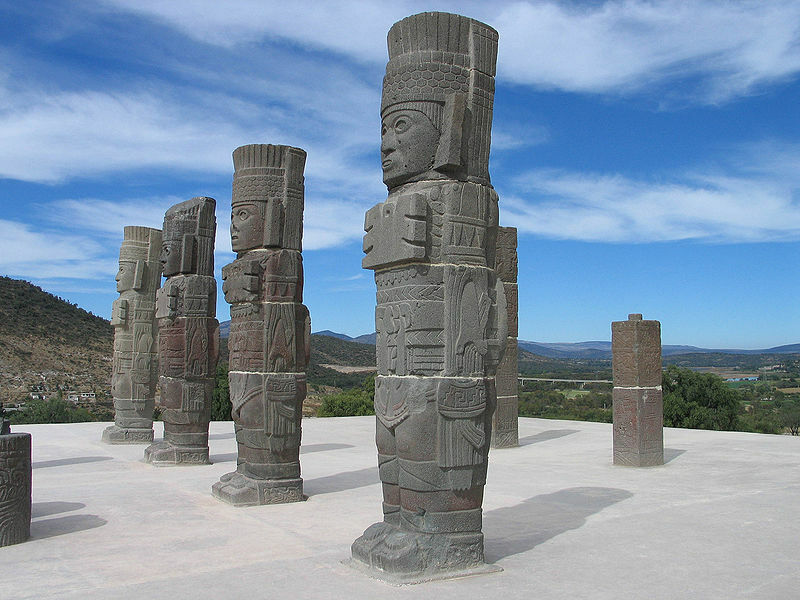 The Toltec statues are quite a bit smaller and contain more detail in bas relief (see more images here) than the Easter Island figures. These two statues also had different functions. The Easter Island figures might have served as memorials for dead leaders. In contrast, the Atlantean warriors served both as columns for the temple roof and as temple guardians. Although there are definite differences, it is interesting to observe a few similarities between these monuments. Both are placed in an elevated area (the warrior figures are placed on top of a pyramidal base, whereas the Moai figures are placed on platforms.1 Decorative headdresses were originally found in both groups as well. The warriors wear feather headdresses and the Moai figures would have originally worn red tufa headdresses (read an interesting article about the how these red hats may have been rolled down an ancient volcano). I also see some similarity in the frontal, rigid stances for both these sculptural groups. The linear arrangement of the statues is also similar, although that similarity more easily observed today since the warrior figures no longer function as columns. It's interesting to see how a few similarities were appearing at the same time across the world. Perhaps we could chalk up these similarities to Hegel and his Geist theory? 1 I should point out, though, that most of the Moai figures are still located in the quarries instead of platforms. It is unclear why some figures were left in the quarries as opposed to those that are on platforms. However, there are some distinct differences between the two groups. The figures on the platforms are stockier, less angular, and have less accentuated features than those left in the quarries.